More Than 2K Flags Planted for Opioid Awareness in Marlborough, Mass. 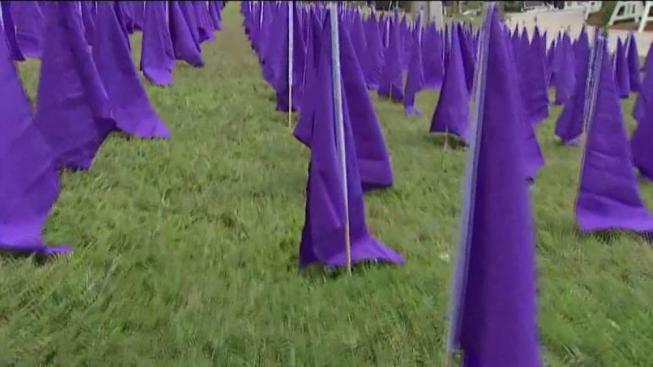 More than 2,100 purple flags line the front lawn of the Walker Building in Marlborough, Massachusetts, in honor of International Overdose Awareness Day. In honor of International Overdose Awareness day, one group in Marlborough, Massachusetts, is coming together to make a statement about the ongoing opioid crisis in Massachusetts. Purple flags line the front lawn of the Walker Building in Marlborough, 2,107 of them. The flags were put up there by a local mother who is on a mission to raise awareness. For Kathy Leonard, the opioid epidemic hits close to home. "I lost my son at 27 to a heroin overdose in December of 2014," Leonard said. At the time, Leonard did not realize just how many lives are lost each year to opioid overdoses in Massachusetts. It is a number that keeps rising and one she started representing with purple flags, hoping it would capture attention and spark conversation. "I just felt like I needed to do something I’m not the type of person to sit back and just wait for things to happen," Leonard said. "It’s one thing to hear that number, but it’s another to see it." Leonard has put the flags in the ground for three years and each year she has to buy more because the number of opioid related deaths keeps rising. There will be a vigil Thursday night in honor of all overdose victims. A stage will be set up right in front of the purple flags. Lynn Wencus of Wrentham is one of many who plan to attend. Her son Jeff died of an overdose in February. There will be a flag for him in Marlborough next year. "The amount is just overwhelming," Wencus said. "I think it’s an eye opener and people’s eyes need to be opened." The vigil will take place Thursday night in front of the Walker Building in Marlborough at 7 p.m.